But actually it was a good thing as now I had to unravel only the yoke and some of the sleeve length. Because now it fits my daughter. First I planned to knit it for my son, but it was too snug for him and therefore my daughter got it for herself. I wasn’t feeling like knitting the fair isle yoke again, so it came out really boring and plain, yet practical, pullover. But I am so happy that I got this thing out of my stash! Then I knitted mittens for Maibrit as she really needed a pair. I am not a huge fan of knitting mittens nor fair isle knitting, but when I finally get going I quite like it. I chose Rowan “Felted Tweed” (purple) and “Fine Tweed” (mustard “leyburn” and petrol Nidd) from my stash and I really really love those yarns! I haven’t knitted mittens for a while and therefore I made a mistake by knitting the space between the cuff and thumb too short. Next time I will do better. 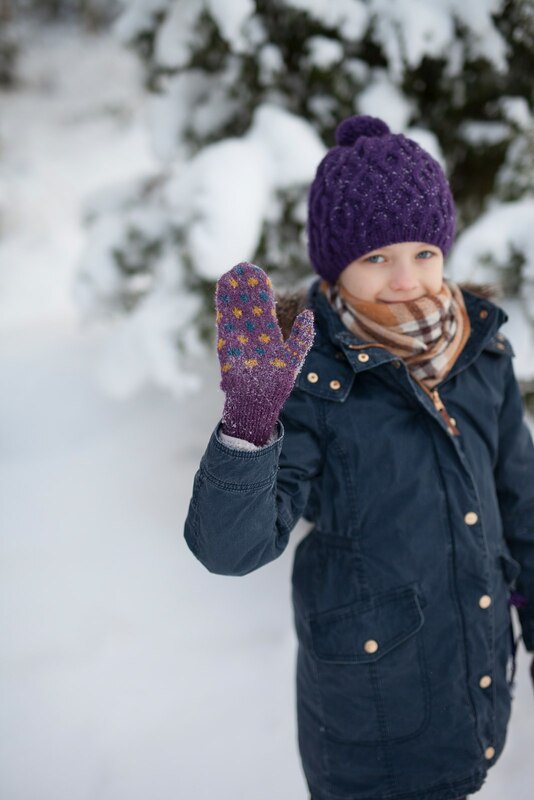 But these mittens are warm and that is the most important thing (you see our weather from the photos). Ravelry link. Maibrit also needed a new hat to go with her new jacket. I chose my favourite cable pattern from my Manti cardigan pattern (or from my Elfi hat pattern) and used leftover yarn (Katia Peru). I casted on 70 sts using tubular cast-on and knitted 1×1 rib for 4 rows. Then I increased the stitches to 92 to be able to knit 4 repeat of the pattern. After I had worked first half of the second diamond, I started to decrease the purled stitches. Easy. I like yarn pom-pom, but Maibrit chose a fur one for her hat. I also lined the hat with cotton jersey as we live in quite windy and cold climate. Ravely link.